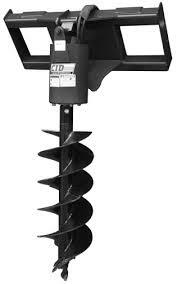 9", 12", 15", 18", AND 24" AUGER BITS AVAILABLE FOR RENT WITH THIS ITEM. 30" BIT IS THE LARGEST SIZE THAT THIS WILL ACCEPT. * Please call us for any questions on our auger skidsteer rentals in Butte MT, serving Southwestern Montana and the Butte, Anaconda, Phillpsburg, Deerlodge, Dillon, Whitehall, Sheridan, Twin Bridges, & Boulder MT areas.